Know the email address of a missing Bandmember? Click here to contact them! Organized in 1946 under the command of Chief Warrant Officer Chester E. Whiting, the U S Army Field Band was originally designated the Army Ground Forces Band - to provide a presence in the nation's capital that honored the "ground" soldier in the same manner that the US Army Air Forces Band honored those serving in the Army Air Corps. In 1950, when the U S Army Ground Forces were redesignated as the US Army Field Forces, the band changed to the name that it continues to use to this day - the US Army Field Band. This website has been created to serve as a meeting place for those who have served in the US Army Field Band - and a place where others can come to find out about the history of the band. Related to a Field Band member? Children, spouses and others who are related to former Field Band members are invited to join this website. You will have full access to all material that is posted here plus receive occasional updates. Send your request to Mike Culbertson. We hope you enjoy the material and information that is here. If you are a former member of the band please take a few minutes to register/include your information on this website. And, of course, stop back often to see what's been recently added to the website of the Retiree and Alumni Association of the U S Army Field Band. The Band has announced dates of their 2019 Alumni Weekend. Alumni weekend will take place this year on August 23-25, 2019 at Fort Meade. We will post updates as they become available. This schedule will be updated as more information becomes available. We wanted to get the word so that you can save the dates. Join us for the weekend or any part of it. COL Jim Keene, Commander and Conductor of TUSAFB, was recently inducted into the prestigious American Bandmasters Association. The story below was written by Elizabeth Peace, the band's Public Affairs Officer. It appeared in the 14 March 2019 edition of Soundoff!, the weekly newspaper of Fort George G. Meade. FT. MEADE, M.D. – Twenty-five years ago, Jim Keene never anticipated he’d be leading the premier concert band in the country let alone doing so as a Colonel in the U.S. Army. That’s because before joining the Army, Keene’s experience was primarily with orchestras and his work as an entertainer on the piano. The commander of The U.S. Army Field Band at Ft. Meade, Md., Keene will be inducted into the American Bandmasters Association at its annual convention in Loveland, Colo. According to Keene, the honor is due to the soldiers he works with. Keene began his musical career at the age of four when he started taking piano lessons at his Albuquerque, New Mexico, home where he was born and raised. For 30 years, he took lessons while playing both piano and violin for the Albuquerque Youth Symphony and for his high school music program. He graduated from the University of New Mexico with a Bachelor’s degree in Piano Performance before attending Southern Methodist University for his Masters degree in orchestral conducting, all through scholarships. Keene also had the opportunity to be the accompanist for violinists auditioning to attend Julliard and Eastman for spring auditions for several years. “My experience as an accompanist and work at Southern Methodist University, I had the chance to meet an entire generation of violinists who then went on to perform and even lead nearly every major orchestra in the world,” he said. Following his graduate degree, he was hired at Southern Methodist University as the assistant orchestra director. Around that time, he received a phone call that would change the trajectory of his career. It was Keene’s mom who urged him to audition as a band conductor. While not something he took seriously at first, his audition at Ft. Meade, Md. with The U.S. Army Field Band changed his mind. “They had me at the first note. I was just amazed by their level,” he said. “I had no idea the Army had this quality of musician. I conducted a bar and I just cut off the group and I said: ‘Who are you guys?’ I said: ‘I’ll never get a better opportunity, tell me what I have to do.” Some of them still remind me of that. Keene said over the last 25 years, his objective has been to figure out how music can help the Army accomplish its mission and objectives. He said like many of his colleagues in the world of music, he is focused on enduring qualities. Over time, he said, the nation has gone further away from its Army. He said the Army isn’t alone in that problem, that orchestras all over the world have become distant with their founding principles. He said there’s a mantra that each unit carries that becomes integral to who they are and everything they do. As the conductor and commander of the Army Field Band, Keene said it has been an honor to be a part of the unit and take them musically to another level. On March 8, Keene will conduct the U.S. Air Force Band in Loveland as part of his induction into the American Bandmasters Association. Paul Horn began playing the piano at the age of four, the clarinet at ten, and the saxophone at twelve. He studied the clarinet and flute at the Oberlin Conservatory of Music in Ohio, earning a bachelor's degree. He gained a master's degree from the Manhattan School of Music. Moving to Los Angeles he played with Chico Hamilton's quintet from 1956 to 1958 and became an established West Coast session player. He played on the Duke Ellington Orchestra's Suite Thursday and worked with Nat King Cole, Tony Bennett and others. He scored the 1959 animated television series Clutch Cargo. Horn's Quintet produced jazz albums for Columbia and RCA Victor up until 1966. During this period, he was the subject of a David Wolper television documentary, Portrait of a Jazz Musician. Horn became a practitioner of Transcendental Meditation. He attended training at the Maharishi Mahesh Yogi's ashram along with The Beatles on their 1968 trip to India. Following his experiences in India Horn's recordings moved from jazz to world and new-age music. In 1970, he moved with his two sons Marlen and Robin from his first marriage to Lilian Yvonne Jourdan, and second wife Tryntje Baum to Victoria, British Columbia, on Vancouver Island. He formed his own quintet and recorded film scores for the National Film Board of Canada. While well practiced as a jazz musician, many of his works defy such categorization. As well as the Inside series, he recorded other albums of jazz with musicians from a range of cultures and backgrounds including China and Africa. He lived in British Columbia and Arizona. He was most recently married to the Canadian singer and songwriter Ann Mortifee. It's hard to believe (time flies!) but Devers Hall is 20 years old this month. It was March 1999 that a group of dignitaries assembled to cut the ribbon at this new facility. 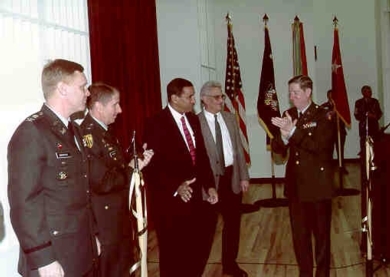 Shown in the photo (l to r) Col. Bruce Berwick (Baltimore District Engineer for the Army Corps of Engineers), Major General John G. "Gil" Meyer, Jr, (Chief of Public Affairs, US Army), Hon.Togo West (Secretary of the Army), Sergeant Major (Ret) Joseph Greco (U S Army Field Band), and Col Jack H. Grogan, Jr., (Commander of The US Army Field Band). Rod Young (1st LT, 1970) sends his regards and shares a number of photos from the Dedication of Devers Hall in 1999. Click on " Photos" in the upper left. Click on "Photos" (upper left) to see a large batch of photos that Josef orosz has sent along for us to enjoy. In fact, we're all in print! Thanks to the diligent efforts of Mike Culbertson, SGM Ret. (2009), each of us has a special place in Mike's book - Seventy Years on the Road. Mike has managed to track down each of the 1770 people who have been assigned to the Field Band (and its predecessor - The Army Ground Forces Band) and provided a short snapshot of each one of us. "This book does not tell of all the concerts the band has played. Instead, it documents the service of the more than 1770 people who have been assigned to the Field Band. Each instrumental and vocal musician is listed, as are the off-stage performers who handled all the things required to put the tour on the road." Included are sections about the 1st Combat Infantry Band, The Army Ground Forces Band, the evolution of the Insignia of the Field Band, listing of retirees by year, Commanders, Commissioned Officers, Warrant Officers, and Enlisted Soldiers. You'll never read all 292 pages from beginning to end. But you will find yourself continually picking it up to answer the question, "What was the name of the person who..."
Available for purchase online from Lulu.com as either a paperback book ($17.50) or a downloadable PDF file ($4.99). We've been busy getting the new TUSAFBRAA website designed and ready for use. It's now up and running and all set to go. If you see a problem/glitch/typo please let us know. We look forward to meeting you here on the new website. Former Member of the Field Band? All former members of the U S Army Field Band have been entered into the database for this website. If you are a former member of the band, click on JOIN HERE (upper right), enter your name, and complete the short sign-up form. Your name will then be forwarded to the website administrators for verification. Once you are verified you will have full access to all parts of the webiste.